Draft: 2012, Minnesota Twins, 1st rd. State Championship in 2012...named First-Team Rawlings Preseason All-American after hitting .513 with 17 doubles, three home runs, 35 RBI and 38 stolen bases during senior season; as a pitcher, went 10-1 with five saves and 154 strikeouts in 81.0 innings pitched...struck out 18 batters in 7.0 innings pitched in the deciding game of the Georgia Class AA State Championship Series...selected to play in the Under Armour All-American Game in 2011...played football and was an All-State defensive back and receiver as a senior and All-Region as a quarterback as a junior...participated in Twins Winter Caravan in 2016 and '17. Made Twins Opening Day roster for third time in career and was Opening Day centerfielder March 29 at Baltimore...Placed on 10-day disabled list with migraines April 15...Went on rehab assignment with Single-A Ft. Myers April 22...fouled a ball off left big toe, fracturing it in his first rehab game April 22 at Bradenton...Returned from rehab assignment and reinstated from disabled list May 10...Upon return, played in 17 games for the Twins, hitting .122 (6-for-49) with two doubles and was placed back on 10-day DL with a left big toe fracture...Went on rehab assignment with Triple-A Rochester...eventually returned from rehab, reinstated from DL and optioned to Rochester July 2...Placed back on the 7-day disabled list July 31 with a left wrist strain...Went 5-for-5 in stolen base attempts, extending his club record to 29 straight steals; last caught by Wellington Castillo May 23, 2017 at Baltimore...Combined to hit .226 (51-for-226) with 15 doubles, one triple, four home runs, 18 RBI, 12 walks and nine stolen bases in 63 games between Rochester and Minnesota on the season. Made Twins Opening Day roster for second time in career and was Opening Day centerfielder April 3 vs. Kansas City, batting third...Began the season hitting .195 (46-for-236) in first 78 games to July 3, but hit .314 (71-for-226) in final 62 games...Placed on 10-day disabled list with left groin strain July 15; reinstated August 1...Named Twins representative for the Heart and Hustle Award...Hit safely in career-high 12 straight August 10-21, hitting .400 (18-for-45) with two doubles, two triples, four home runs and 12 RBI...Hit .387 (12-for-31) in 10 July games and .324 (34-for-105) in 29 August games...Hit second career inside-the-park homer August 18 vs. Arizona; added a double and a triple, becoming just the fifth player in baseball in 70-plus years since the end of World War II, and the first in 41 years, to have those three types of hits in the same game: Jerry Snyder (1956), Roger Maris (1958), George Altman (1961), and Al Bumbry (1976)...Hit three home runs August 27 at Toronto, becoming the eighth player in club history with a three-homer game, joining Bob Allison (May 17, 1963 at Cleveland), Harmon Killebrew (September 21, 1963 at Boston), Tony Oliva (July 3, 1973 at Kansas City), Justin Morneau (July 6, 2007 at Chicago-AL), Max Kepler (August 1, 2016 at Cleveland), Brian Dozier (September 5, 2016 vs. Kansas City), and Eddie Rosario (June 13, 2017 vs. Seattle); also set single-game career-highs in hits (4) and RBI (5); also stole a base in the game, becoming just the fifth player in AL history to steal a base and hit three homers, joining Carl Reynolds (1930), Leroy Stanton (1973), Joe Carter (1989) and Alex Rodriguez (2010)...Named the AL Player of the Week for the period ending August 27th, hitting .333 (11-for-33) with nine runs scored, a double, five home runs, 10 RBI and two stolen bases in eight games; among AL players, finished first in home runs; tied for first in total bases (27); tied for second in extra-base hits (6) and RBI; fourth in slugging percentage (.818); and tied for fourth in hits and stolen bases...Missed one game on August 30 after hurting his hamate bone on left hand... Stole 24 consecutive bases May 24 through the end of the season, setting a Twins record for consecutive steals...Set single-season career-highs in games (140), runs (69), hits (117), home runs (16), RBI (51), walks (38) and stolen bases (29)...Went 29-for-30 in stolen base attempts for a 96.7% success rate, the highest in baseball and a Twins record; highest in baseball since Alcides Escobar in 2013 (100.0%)...Ranked third in baseball in defensive runs saved (24), second among outfielders (Andrelton Simmons - 32 and Mookie Betts - 31)...Posted a .951 Zone Rating, the fourth-best for a centerfielder in baseball history and best since Gabe Kapler in 1999 (.953)...Played 137 games (131 starts) in centerfield, fourth-most in the AL; most for a Twin since Denard Span played 153 games in 2010... Given 2017 Wilson Defensive Player of the Year Award as well as their award for Best Defensive Centerfielder...Given 2017 Jim Kaat Award for Twins Defensive Player of the Year and Charles O. Johnson Award for Most Improved Twin, both awards voted on by the Twin Cities Chapter of the BBWAA...Given 2017 Rawlings Gold Glove Award, becoming fourth different outfielder in club history, joining Tony Oliva (1x, 1966), Kirby Puckett (6x, 1986-89 & 1991-92) and Torii Hunter (7x, 2001-07)...also earned the AL Platinum Glove Award (Colorado's Nolan Arenado won NL). Made Twins Opening Day roster for first time in career and was Opening Day centerfielder April 4 at Baltimore, batting ninth...Hit .156 (7-for-45) in 17 games and was optioned to Triple-A Rochester April 25...Named International League Player of the Week May 29, hitting .478 (11-for-23) with three doubles, three home runs, five RBI, eight runs scored and three walks in six games...Recalled by Minnesota May 31 (Danny Santana - disabled list)...Recorded first career three-hit game with Twins June 5 vs. Tampa Bay...Hit .204 (31-for-152) in 46 games for the Twins in second stint and was optioned to Triple-A Rochester August 8...Named International League Player of the Week for second time August 28, hitting .353 (12-for-35) with one double, four home runs, eight RBI and eight runs scored in seven games...Recalled by Minnesota for final time September 1...Hit first career grand slam September 4 vs. Chicago-AL, off Anthony Raunado...was part of a stretch in which he hit five home runs with 12 RBI in an eight-game span for the Twins September 1-9...Hit inside-the-park home run October 2 at Chicago-AL, off Chris Sale, which was also his first career leadoff homer (first time hitting out of leadoff position all season)...also marked his 10th home run, becoming the 11th different Twin to reach double-digit home run totals, tying an MLB record (Detroit - 2004 and Houston - 2015)...Hit .287 (29-for-101) with six doubles, two triples, nine home runs, 22 RBI, 24 runs scored and 10 walks in 29 September/October games; 24 runs scored led the AL, nine home runs were tied for seventh, and 22 RBI ranked 10th...Combined to hit .256 (125-for-488) with 30 doubles, nine triples, 21 home runs, 62 RBI, 85 runs scored and 17 stolen bases in 141 games between Rochester and Minnesota...Given 2016 Jim Kaat Award for Twins Defensive Player of the Year as voted on by the Twin Cities Chapter of the BBWAA. Was an invite to Twins spring training for second straight season and was reassigned to minor league camp March 15....Began season with Double-A Chattanooga....Recorded season-high four hits April 13 at Montgomery, hitting two singles, a double and a triple....Named Twins minor league Player of the Week May 3, hitting .423 (11-for-26) with one double, one home run, six RBI, nine runs scored, six walks and four stolen bases....Hit second professional grand slam May 19 vs. Montgomery...Hit .364 (32-for-88) with a .447 on-base percentage from May 19-June 12, including an eight-game hitting streak June 5-12, and had his contract selected by Minnesota June 14....Named Southern League All-Star, but did not play in game due to promotion to Minnesota....Made major league debut June 14 at Texas, starting in centerfield and batting ninth, going 0-for-4 with a run scored, the game-winning run in the ninth inning in a 4-3 Twins win....Recorded first major league hit, June 15 at St. Louis, tripling off John Lackey; became the fourth Twin to ever triple for first major league hit, joining Jorge Polanco (June 27, 2014), Jimmie Hall (April 16, 1963) and Bernie Allen (April 10, 1962)....Recorded first career stolen base June 21 vs. Chicago-NL....Recorded first career three-hit game June 22 vs. Chicago-AL, including three runs scored and first career double....Placed on 15-day disabled list June 26 with a left thumb sprain, an injury he suffered on June 23 vs. Chicago-AL, attempting to steal second base...returned from rehab at Triple-A Rochester and officially optioned there August 10...Named International League Player of the Week August 10-16, hitting .400 (14-for-35) with one triple, one home run, four RBI and seven runs scored in eight games... Recalled by Minnesota August 20 when the Twins placed Aaron Hicks on the disabled list....Recorded first career RBI August 22 at Baltimore, singling in Torii Hunter....Hit first career home run September 27 at Detroit, a solo shot off Jose Valdez....Named an outfielder on MiLB.com Twins organizational All-Star team....Named second best prospect in the Southern League by Baseball America (teammate Miguel Sano ranked first)....Ranked top prospect, best hitter for average, fastest baserunner, best athlete, best defensive outfielder and best outfield arm in Twins system by Baseball America, entering 2016. Began season with Single-A Cedar Rapids…Reached base safely in first 29 games April 4-May 8, posting a .485 on-base percentage in that span…Named Twins minor league Player of the Month for April, hitting .392 (31-for-79) with five doubles, three triples, four home runs, 21 RBI, 25 runs scored and nine stolen bases in 22 games…Hit first professional grand slam May 16 vs. Burlington…Recorded first professional five-hit game June 5 vs. Quad Cities, going 5-for-6 with a double and two triples…Named Twins minor league Player of the Week June 14, hitting .406 (13-for-32) with three doubles, nine RBI and six runs scored in seven games…Named a Midwest League midseason All-Star…Ranked top prospect in baseball at midseason by Baseball America and MLB.com…Selected to play for the U.S. in the Sirius-XM All-Star Future's Game at Citi Field in New York, going 0-for-2 with two strikeouts off the bench…Promoted to Single-A Ft. Myers June 24…Named Florida State League Player of the Week July 29, hitting .333 (10-for-30) with three triples, three home runs, six RBI, eight runs scored and six walks in seven games for the Miracle…Hit safely in season-high 14 straight games August 5-21…Named Twins minor league Player of the Month for August, hitting .402 (35-for-87) with 20 walks, 16 stolen bases, 21 runs scored and a .523 on-base percentage in 26 games...also named August Player of the Month by Topps…Combined to hit .334 (163-for-488) with 19 doubles, 18 triples, 12 home runs, 77 RBI, 109 runs scored and 55 stolen bases in 125 games between both levels…Led all minor league full-season players in triples (18), second in runs scored (109), tied for sixth in OPS (.944), 10th in hits (163) and 12th in stolen bases (55)…Named postseason All-Star, Most Valuable Player and Prospect of the Year in the Midwest League by Baseball America…Awarded with 54th annual J.G. Taylor Spink Award as Topps/Minor League Baseball's Player of the Year; at 19-years-old, he joined Mike Trout (2010), Delmon Young (2005) and Andruw Jones (1996) as only players to win the award as a teenager...named to Topps/Minor League Baseball's Class-A All-Star Team…Named Minor League Player of the Year by Baseball America after being named Minor League All-Star, High Class-A All-Star, Low-Class A Player of the Year and Low Class-A All-Star by same publication…Was given the Sherry Robertson Award as Twins minor league Player of the Year…Played in 12 games in the Arizona Fall League with Glendale Desert Dogs, hitting .212 (11-for-52) with one double, three home runs, eight RBI and 10 runs scored before being shutdown with a right shoulder strain...named to West Division Fall Stars Team...ranked number one in the Top 20 AFL Prospect List by Baseball America...named to AFL Top Prospects Team…Named an outfielder on MiLB.com Twins organizational All-Star team…Named top prospect, best hitter for average, fastest baserunner, best athlete, best defensive outfielder and best outfield arm in Twins system by Baseball America entering 2014. Began professional career with GCL Twins...hit first professional home run July 7 vs. GCL Red Sox...promoted to Rookie Elizabethton August 7...hit .395 (15-for-38) in final 10 games for E-Town...ranked top prospect in Gulf Coast League by Baseball America...ranked 10th best prospect in Appalachian League by Baseball America...ranked second best prospect in Twins organization by Baseball America entering 2013...ranked 19th best prospect in baseball by MLB.com and 10th best by Baseball America entering 2013. October 2, 2018 Minnesota Twins recalled CF Byron Buxton from Rochester Red Wings. August 14, 2018 Rochester Red Wings activated CF Byron Buxton from the 7-day disabled list. August 1, 2018 Rochester Red Wings placed CF Byron Buxton on the 7-day disabled list retroactive to July 31, 2018. Left wrist strain. July 27, 2018 Rochester Red Wings activated CF Byron Buxton from the 7-day disabled list. July 14, 2018 Rochester Red Wings placed CF Byron Buxton on the 7-day disabled list retroactive to July 13, 2018. Left wrist strain. July 2, 2018 Minnesota Twins optioned CF Byron Buxton to Rochester Red Wings. June 19, 2018 Minnesota Twins sent OF Byron Buxton on a rehab assignment to Rochester Red Wings. 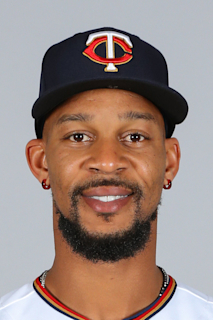 May 30, 2018 Byron Buxton roster status changed by Minnesota Twins. May 10, 2018 Minnesota Twins placed CF Byron Buxton on the 10-day disabled list. Left great toe fracture. May 10, 2018 Minnesota Twins activated CF Byron Buxton from the 10-day disabled list. April 22, 2018 Minnesota Twins sent DH Byron Buxton on a rehab assignment to Fort Myers Miracle. April 18, 2018 Minnesota Twins placed CF Byron Buxton on the 10-day disabled list retroactive to April 15, 2018. Migraines. August 1, 2017 Minnesota Twins activated CF Byron Buxton from the 10-day disabled list. July 28, 2017 Minnesota Twins sent OF Byron Buxton on a rehab assignment to Rochester Red Wings. July 15, 2017 Minnesota Twins placed CF Byron Buxton on the 10-day disabled list. Left groin strain. September 1, 2016 Minnesota Twins recalled CF Byron Buxton from Rochester Red Wings. August 8, 2016 Minnesota Twins optioned CF Byron Buxton to Rochester Red Wings. May 31, 2016 Minnesota Twins recalled Byron Buxton from Rochester Red Wings. April 25, 2016 Minnesota Twins optioned CF Byron Buxton to Rochester Red Wings. August 20, 2015 Minnesota Twins recalled Byron Buxton from Rochester Red Wings. August 10, 2015 Minnesota Twins optioned CF Byron Buxton to Rochester Red Wings. August 7, 2015 Minnesota Twins sent CF Byron Buxton on a rehab assignment to Rochester Red Wings. June 14, 2015 Minnesota Twins selected the contract of CF Byron Buxton from Chattanooga Lookouts. December 19, 2014 Minnesota Twins invited non-roster CF Byron Buxton to spring training. August 12, 2014 Byron Buxton assigned to New Britain Rock Cats from Fort Myers Miracle. July 6, 2014 Fort Myers Miracle activated CF Byron Buxton from the 7-day disabled list. May 11, 2014 Fort Myers Miracle placed CF Byron Buxton on the 7-day disabled list. May 4, 2014 Fort Myers Miracle activated CF Byron Buxton from the 7-day disabled list. April 1, 2014 Fort Myers Miracle placed CF Byron Buxton on the 7-day disabled list. January 9, 2014 Minnesota Twins invited non-roster CF Byron Buxton to spring training. June 24, 2013 CF Byron Buxton assigned to Fort Myers Miracle from Cedar Rapids Kernels. April 1, 2013 Byron Buxton assigned to Cedar Rapids Kernels from Elizabethton Twins. March 27, 2013 CF Byron Buxton assigned to Minnesota Twins. August 7, 2012 Byron Buxton assigned to Elizabethton Twins from GCL Twins. June 14, 2012 Byron Buxton assigned to GCL Twins. June 13, 2012 Minnesota Twins signed CF Byron Buxton.